The red and white Longnose Hawkfish adds activity and personality to any tank. They are often found resting on live rock overlooking the aquarium. Generally it is peaceful, however there are a few exceptions. One per tank is the rule, unless it’s a bonded pair or very large system. 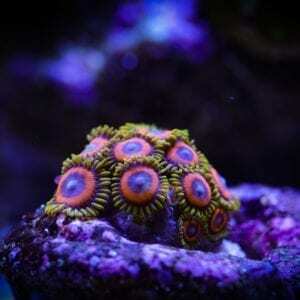 Even if kept singly, provide a system of at least 50 gallons with plenty of live rock. The Longnose Hawkfish gets along with most other species of fish as long as it’s not big enough to eat. They will most likely go after shrimp, crabs and may even harass smaller fish. It is advisable to cover a system with a Longnose Hawkfish. Occasionally, they have been known to jump. They are also prone to getting stung by Cataphyllia coral species such as the Elegance coral. The Longnose Hawkfish will eat most types of marine meaty foods. They seem to especially enjoy live feeder Shrimp. They will often perch on live rock and wait for prey to pass by. Compared to other Hawkfish, they may or may not eat a cleaning crew. Keeping the fish well fed will help minimize the risk. Like all Hawkfish, they should be fed twice a day. The Longnose Hawkfish is aggressive eater, so getting them to eat should not be an issue. However, when newly introduced live food may have to be available to entice feeding. Overall this hardy little fish will only grow to 5 inches. 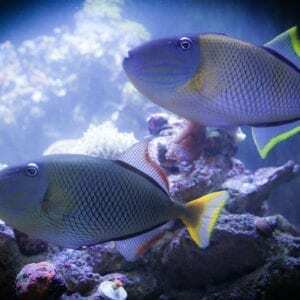 It makes a great addition to any peaceful moderately large reef aquarium.